we spent a couple of days in the charming town of Helen, Ga.
has been recreated to look like an Alpine village. It was a pseudo-Bavaria; no passport needed! I fell head over heels for this quaint little knock-off, really, I did. especially since the Oktoberfest celebration was underway. she sent us to a restaurant called The Troll Tavern. 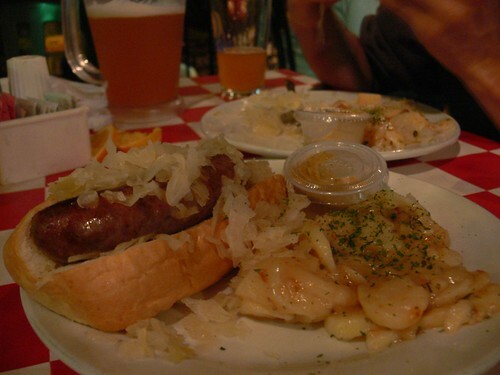 I didn't care for those tangy German potatoes, but I loved the brat! After dinner, by foot, we made our way to the end of town. as the best place to go to get the most authentic Oktoberfest experience. 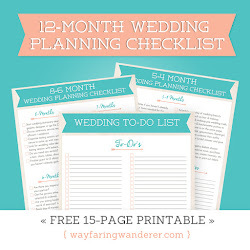 That was a no brainer, we wanted to go there! This place was bursting at the seams with folks having a fantastic time. After Cody and I had our Hefeweizen, we were itching to join in on the action. You'll be happy to know, I got to do my chicken dance, and Cody did it too! campsite. We had plans to go for a hike the next day. In 1969 it was decided by some local Helen business men, that the town needed sprucing up. 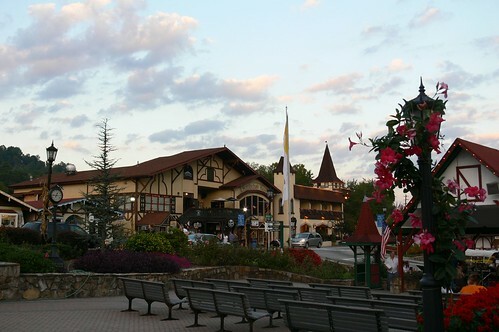 They had a vision to transform their town into an Alpine village to promote tourism. Each shop owner paid to have their own buildings renovated. Interesting tidbit: Festhalle is run by Helen's own Chamber of Commerce - built in 1979. The first Oktoberfest was held in 1810 in Munich, Germany. 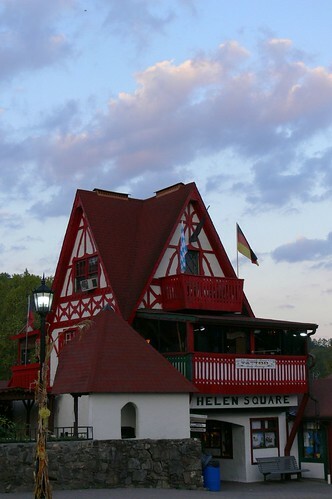 Helen had their first Oktoberfest celebration in 1970. 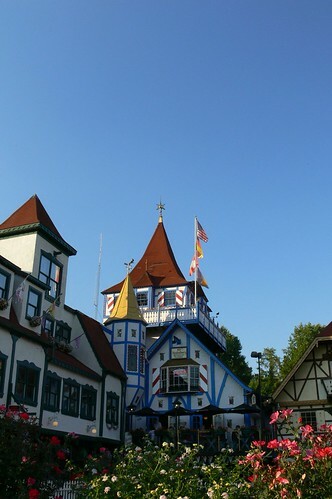 Helen claims that they are home of the longest running Oktoberfest in the world! Nearly 30,000 people come to celebrate every year. LOL! Glad to read that you had a fun time. Wonderful photos. I'm hungry now & ready to chicken-polka! How fun. beautiful - and my husband was like - "where is that?""""" Looks like an amazing town and an amazing time for you. I'm jealous! Great pictures.......the food shot made me kind of hungry! I love that town. It does reminds me of Germany! GA girl here who only a year ago moved from the GA Blue Ridge Mountains. I know Helen. And I can Chicken Dance. Love the pictures... this reminds me of Swiss Days!! Looks like fun. this reminded me a lot about the Oktoberfest I attended last month! Thanks for sharing. SHOCK YOU AND CODY DOING CHICK DANCE WHAT WERE YOU THINGING OF? At your age you should be into Hard metal bands.But there again it was a Hard metal band but with brass?glad you enjoyed yourself.i can't get this pic of you & Cody doing chick dance.Next try Rap music dareyou to try it.Bye Only joking. Looks like lots of fun! A magical WW to you! I would never picture a German-looking town in Georgia! That place looks great--thanks for the photos! ahh i haven't been to Helen in such a long time. You're right it's a fun place. hey how much snow did you get? Man that looks like a blast! Now I want some kraut! Wow that food looks awesome! 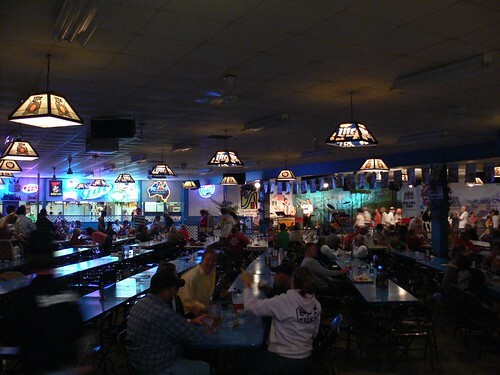 And I esp love the picture of the tavern with all the blue lightness about it. Gorgeous. But then I'm a blue person. Love it! Everything looks so bright and colorful and happy. Almost like Germany, except without the cloudy skies. that was fantastic. I love little field trips! I can smell the sausage and sauerkraut from here!!! I love Germany like crazy. I feel like I an in Germany!! Cute town. Food no good for the figure but a chicken dance or 2 will work it off. Is that a map of Australia I see on the back wall in the photo before the chicken dance?? Looking forward to looking in on you again! That looks like so much fun! Loved all the pictures! Wow - this is in GA?! Amazing! Heading up to Boone this weekend - can't wait to see the mountains!